Raw apple cider vinegar (ACV). Raw or virgin coconut oil. I’m totally in love with both ACV and raw coconut oil. Both deserve their own articles…ha! they each deserve their own series of articles…but today I’m going to talk about my growing love affair with coconut oil. Combating the problem became a two-step process – outside in and inside out. The latter meant making changes to my diet…usually not a good sign for a Class A Junk Food Junkie like me. Adding to the challenge, I’ve had a life-long dislike of coconut. But hey, I’m a rebel and dammit, I was desperate to Stop The Itch so if that meant chocking down coconut, then choke I would. A funny thing happened though, I’m finding a like coconut now. Huh, go figure. When I decided to try coconut oil, I only intended to go the outside-in method of using it topically on my itchy body parts. The reason? I’ve never liked coconut in the past. 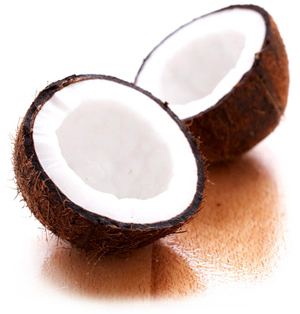 Contrary to what I thought, though, coconut oil has a mild smell relative to fresh coconut meat. It smells beachy to me and I like it. My first source of raw or virgin coconut oil at my friendly neighborhood Whole Foods store and I use the 365 brand (which I think is the in-house Whole Foods brand). Since the oil is solid at room temperature (plus I keep a cool house in winter), I need to melt it in order to apply it to my skin. I scoop out a tiny bit of coconut oil at a time and hold it in my hand until it softens. This only takes about 10-15 seconds. Then I dab the liquefied oil onto my body part I want to moisturize. And little leftovers and I rub it into my hand or some other lucky body part. Different parts of my body absorb the oil at different rates but within a few minutes, it’s absorbed enough so that the greasy feeling is gone and I can get dressed. Over the day, I dab on more coconut oil whenever I start to feel a little itchy. OMG! I’ve been using the coconut oil for about 2 weeks now and my itchiness is much less than before I started with it. I dab it on after a shower, before bed and, if I start to fell itchy, one to two other times during the day. The coconut oil provides blessed itch relief within about 1-5 minutes after I apply it. I can’t believe how well it works. Some days, I’m itch free thanks to the coconut oil and other days I’m still a little itchy. It all depends on the histamine levels in my body. And I do still have some days, mostly at night, when the itchies get to be too much and I succumb. The good news, though, is I itch much less. I don’t know the scientific process, but my observation is because the skin is well-moisturized, it doesn’t flare up with as much itchiness. As a companion to the coconut oil, I’ve also done away with using soap on my eczema areas. Instead I swab the area with witch hazel which is a natural astringents which is useful as a skin toner and cleanser. Also, because I was the source of my problem is histamine levels, I am once again taking OTC anti-histamines (and I proved it to myself when my eczema calmed after I started the drugs). However, my goal is to do away with OTC drugs by improving my diet to include better food-based antihistamines but I wanted a fast boost for now – and it’s working. I loved the result of the coconut oil on my eczema so much that I’ve started to use it on other body parts too. Pretty much on any body part. For example, I’ve been experimenting with using coconut oil as a moisturizer for my face, right out of the jar…and I’m loving it. With other store-bought moisturizers, my face would start to dry out during the day. With the coconut oil, I go almost all day without my skin drying out. Additionally, I had some occasional breakouts on my face but since I’ve been using the coconut oil, I’ve been breakout free so yeah! I still have an almost full bottle of Jason lotion so I’m going to use that up but once it’s finished, then I’m going to experiment with making my own lotions and skin care products. Putting coconut oil directly onto my skin is more of a topical solution that helps the symptoms but not the cause of my skin problems. I realized I also had to work the problem from the outside in. One obvious answer is better hydration from drinking water. Check. I’m working on getting 2 liters a day of it (and I’ll talk about that in another article). Another way is eating coconut oil and my results are fabulous. I started to write about it here and then decided inside out coconut oil should have its own article because it’s had some incredible results for me. Anybody else liking coconut oil or milk? I’d love to know about your recipes or hear your stories.